Skyrim looks hot but Bethesda's Todd Howard says it's "hard to say" whether it represents as much of a leap forward as Oblivion was from Morrowind. 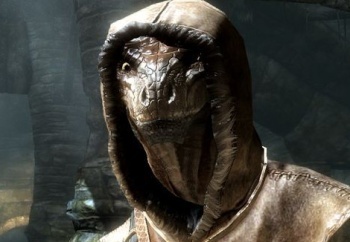 Like the series or not, you have to give props to Bethesda for pushing the technological envelope with each new iteration of The Elder Scrolls series. Arena was good stuff but Daggerfall was a revolution, albeit a buggy one; Morrowind scaled things back but upped the ante with one of the most gorgeous and fantastically unique RPG settings ever; and then Oblivion came along and declared itself "Eye Candy Supremo," narrated, briefly at least, by no less a personality than Captain Picard himself. Each game represents a quantum leap over its predecessor but Howard, the game director on Skyrim, told PC Gamer he's not sure the new RPG will take as big a step forward as Oblivion did. "Hard to say... I have a hard time looking at it that way," he said. "I think it's close. I don't know that I would say it's as large a leap, just because the technology gap between Morrowind and Oblivion was greater." Mechanically, however, the game will serve up about the same level of changes and improvements as previous releases. "The number of gameplay changes and things like that are probably on the same level," he added. Morrowind was the first Elder Scrolls game to come to consoles, launching on the original Xbox in June 2002; Oblivion was developed for the Xbox 360 and PlayStation 3. Howard had previously said that Bethesda had "very serious" conversations about delaying Skyrim for the next generation of consoles but felt that could keep it visually and technologically "fresh" on current hardware. The Elder Scrolls V: Skyrim comes out on November 11 for the PC, PlayStation 3 and Xbox 360.